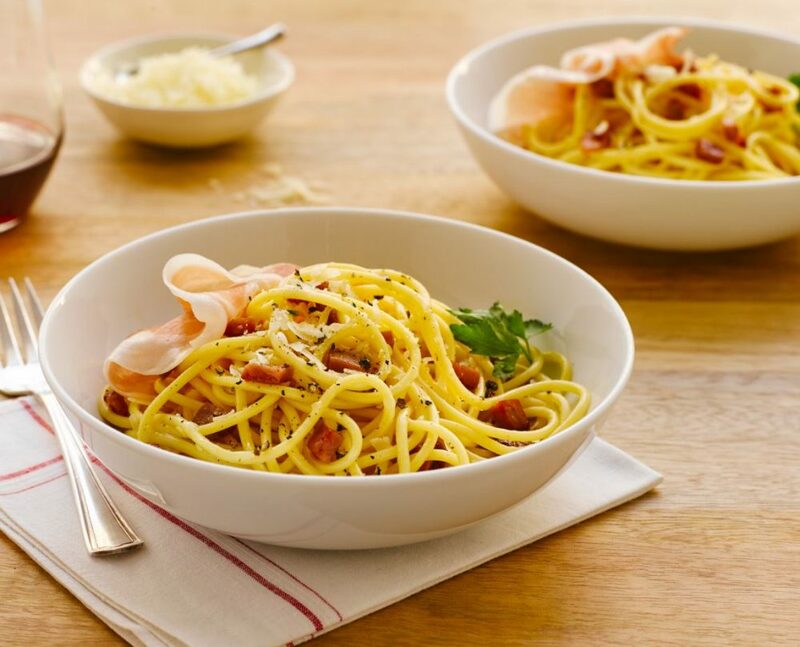 Sure, there are many Prosciutto pasta recipes, but you may want to stake claim over this one. When in Rome, pasta is always cooked until it is al dente. The highest quality ingredients, like Pecorino and Parmigiano, are also often incorporated to pack that high flavor punch. Once this classic plate comes together, every bite will scream with flavor. And, as if this prosciutto pasta plate isn’t satisfying enough, top it with additional grated cheese and serve it with a glass wine that will help cut through the fat, like a classic Pinot Grigio or more sophisticated Gavi from Piedmont. Cut prosciutto into a 1/4-inch dice. In a medium skillet over medium-high heat, cook the prosciutto in oil stirring frequently, until prosciutto is browned; about 5 minutes. Remove from heat and set aside. In a large bowl, whisk the eggs, both cheeses and pepper; set aside. In a large pot over high heat, bring a pot of salted water to boil. Add pasta; cook until al dente. Drain and immediately toss hot pasta with the egg mixture. Add Prosciutto di Parma and pan drippings. Top with additional grated cheese and fresh black pepper, if desired. Note: If the heat of the cooked pasta does not quite set the eggs you can gently toss it again over very low heat in the pan you cooked the prosciutto in. Stir continuously and make sure the heat is as low as it can go so you don’t wind up with scrambles eggs.